Do you have hairy legs? Do you shave your legs often? Okay...I shall not probe any further about these personal hairy issues. I'm quite lucky that I do have much hair on my legs to begin with and I simply could not recall when and why I started shaving my legs. I think its probably due to curiosity during the adolescent phase. I have tried various brands including those disposable types which can give me a bad cut when I do not do it properly. Having tried so many brands, I am still a loyal user of Gillette's shaver. It's important to know that using the suitable type of razor will somehow prevent cuts or roughness on our skin. 1. Round pivoting head for easy maneuvering and soft ergonomic handle. 2. It has 5 progressively-aligned blades which are spring-mounted. 3. Thinner blade edge provide a lower cutting force and gently exfoliating the skin at the same time. 4. Olay sugarberry moisture bar are infused with skin nourishing ingredients which help replenish moisture and breathe radiance into skin. 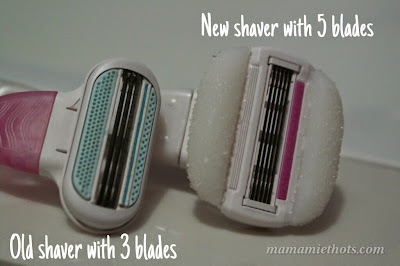 Here I am making a comparison between my current old Gillette razor and the latest Venus & Olay™ Gillette razor. One has 3 blades and the other one has 5 blades. 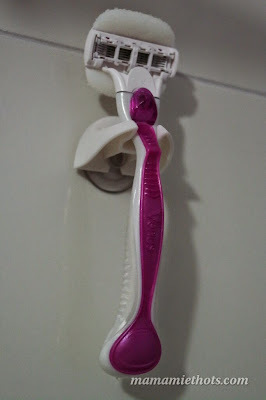 After testing the Venus & Olay™ razor, I loved the scent of sugarberry and it just glided smoothly along my skin when wet (no shaving cream was needed). 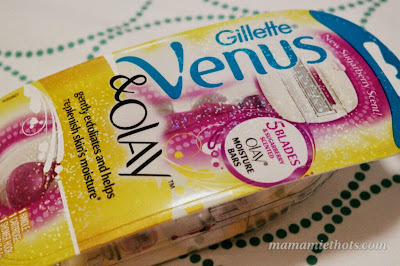 Disclaimer: I received the Venus & Olay™ Gillette razor for review purpose, all opinion are my own.